PACKAGE THIS TITLE WITH OUR 2016 MLA SUPPLEMENT, Documenting Sources in MLA Style (package ISBN-13: 9781319084615). Get the most recent updates on MLA citation in a convenient, 40-page resource based on The MLA Handbook, 8th Edition, with plenty of models. Browse our catalog or contact your representative for a full listing of updated titles and packages, or to request a custom ISBN. Teachers have struggled for years to balance the competing demands of American Literature and AP English Language. Now, the team that brought you the bestselling Language of Composition is here to help. 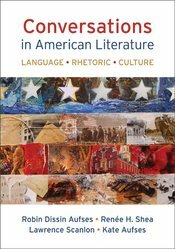 Conversations in American Literature: Language ∙ Rhetoric ∙ Culture is a new kind of American Literature anthology—putting nonfiction on equal footing with the traditional fiction and poetry, and emphasizing the skills of rhetoric, close reading, argument, and synthesis. To spark critical thinking, the book includes TalkBack pairings and synthesis Conversations that let students explore how issues and texts from the past continue to impact the present. Whether you’re teaching AP English Language, or gearing up for Common Core, Conversations in American Literature will help you revolutionize the way American literature is taught. "This excellent text bridges the current gap between the teaching of American Literature and the usual AP Language and Composition course focusing on nonfiction. For the AP Language teacher who is required to focus on American Literature throughout the course, this text will be a godsend, a rich treasure trove of selections that maintain the focus on American Lit yet address the skills necessary for success on the AP Language and Composition exam."